"The End of An Era" -- Dorian Yates wins his sixth Mr. Olympia, while massive Nasser El Sonbaty solidly beats Shawn Ray for second place. From Long Beach, California. 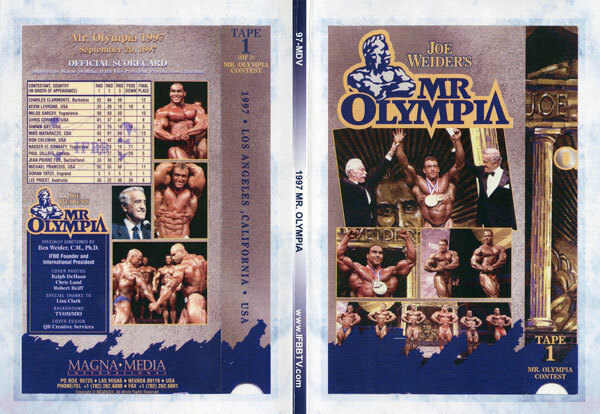 Starring: Dorian Yates (1), Nasser El Sonbaty (2), Shawn Ray (3), Kevin Levrone (4), Paul Dillett (5), Lee Priest (6), Jean-Pierre Fux (7), Chris Cormier (8), Ron Coleman (9), Milos Sarcev (10), Michael Francois (11), Charles Clairmonte (12), Mike Matarazzo (13).